Open to the public today is Project Banaba, an exhibition that tells the story of phosphate mining on the Moana Pacific island of Banaba: once also known as Ocean Island. From 1900 onward, the governments of New Zealand, Australia and the United Kingdom collaborated to extract vast quantities of phosphate rock from both Nauru and Banaba, which was shipped to port cities and towns, such as Napier, and processed to produce superphosphate fertiliser. The creator of Project Banaba, Katerina Teaiwa, has been researching this history for more than 20 years, investigating how and why her ancestral homeland came to be devastated within a period of decades – following millennia of coexistence with what Banabans call te aba, the rock. She presented her findings in a book titled Consuming Ocean Island, with the Project Banaba exhibition growing out of the same research. Key themes running through both the book and the exhibition are the momentous forces of capitalist colonialism juxtaposed with the incredible resilience and creativity of the Banaban people, who relocated to the island of Rabi in Fiji in 1945 and made a new home that continues there to this day. Of course this is plainly false, as indigenous societies across the Moana and around the globe have always maintained their populations without fertilisers, developing sophisticated food systems that integrate with and maintain the balance of natural ecology. The social and environmental impacts of this imbalanced practice continue and are becoming increasingly undeniable. Phosphate mining on Banaba ceased in 1980, and now continues in large-scale operations in Africa’s Sahara desert. The government of Morocco claims territory in Western Sahara that is rich in phosphate, operating mines and selling the rock while the indigenous Saharawi people are displaced, living in Algerian refugee camps for decades. New Zealand fertiliser cooperatives Ravensdown and Ballance are the only remaining international purchasers of the rock from the Saharawi homeland. Meanwhile, closer to home, the effects of fertiliser use and the industrial agriculture it enables are now apparent in our degraded and eroded soils, toxic waterways, and destabilising methane emissions. I like so many other New Zealander’s have a heavy heart this week. It’s hard to try to find something to say following the horrific terrorism event in Christchurch that hasn’t already been said and it’s hard to truly comprehend the factors that came into play to lead down this road. I’ve taken some comfort in attending memorial services, joining others in the community to collectively grieve as well as show solidarity and support. I’m proud that politicians from most parties have come together to swiftly change our gun laws. And I’ve been impressed at the determined effort to focus on the victims and their families, alongside encouraging the country to come together using positivity, caring and support to help families, communities and the nation to heal. It’s also heartening to hear some of the conversations that are taking place, having a good look at New Zealand and New Zealanders and questioning levels of racism in our country. We are all a product of our upbringing and personal experiences but we can also choose to change our understanding of the world and of those around us. We can consciously choose to know more, to understand better and to do better. New Zealanders are known around the world for our mediating and peace-making/keeping skills – so maybe we’re not very good at challenging others on poor behavior. It can be easy to let little things slide, but all those things add up and create a culture where some things are normalised and made okay. Hopefully the discussions taking place will help us consciously as a nation decide what we will accept as okay. Right now in the heat of the aftermath, when the country is truly horrified, grieving and seeking to help, it’s easy to challenge racial or intolerant behavior. The challenge for us is to maintain those standards as time goes by. So what can we do? I can’t tell anyone else what to do but I can tell you what I will do. I will pay attention to my own internal dialogue and thoughts and try to catch any prejudices or intolerance I may have. I will challenge casual racism, sexism, prejudices based on religion or any other form of ‘difference’. I will stand up and speak up. If as New Zealanders we want to say “this isn’t us” – then let’s make sure it isn’t. As a cultural institution MTG Hawke’s Bay has a responsibility to create a better space, to build connections and to lead by example. So I will ensure we build a strong focus on creating connections and breaking down barriers. I’ve previously quoted that museums should be a safe place for unsafe ideas – and because of that we can provide a safe and neutral forum for people to learn about each other, to ask ‘dumb’ questions (there’s no such thing!) and to seek understanding. I hope as a community you will support and join us in this endeavour. Last Saturday saw the return of a kākahu (cloak) to Ngāti Kahungunu, MTG Hawke’s Bay, which once belonged to Airini Donnelly: a wahine Rangatira born Airini Karauria at Puketapu about 1854-1855, her father being the Ngāti Kahungunu chief Karauria and her grandfather Tiakitai, the chief of Waimārama. Her husband, Irishman George Prior Donnelly from County Tipperary, emigrated to Aotearoa in 1862. At Airini’s tangihanga in 1909 at Ōtatara, George gave this particular kākahu to Inspector Dwyer for ensuring the funeral ran smoothly with all the various parties involved. Inspector Dwyer hung it in the Dwyer family home on Ōmāhu Rd in Remuera for many years, before it was offered to Tāmaki Paenga Hira Auckland War Memorial Museum. With the blessings from the great-grandchildren of Inspector Dwyer, Tooki, Anne and Jane, and with agreement from Auckland Museum, this cloak was welcomed back to Ngāti Kahungunu and into MTG. This was supported by local Ngāti Kahungunu who whakapapa to Waimārama, Ōmāhu, Waiohiki, and to Airini. This kākahu has wool incorporated into the making of it, illustrating how Māori were quick to adapt to new materials arriving from England. The importance of Airini’s kākahu to Ngāti Kahungunu and to Hawke’s Bay is very significant to us all, a primary source of history that originates from the past. It represents a torrid time in our history: English land grab wars, tribal alliances on both sides of the fence, the outgoing of the last cannibal generation and the imposition of Westminster law and Christianity – a collision of cultures and everything in between lost in translation. This was a tumultuous period for all indigenous peoples of the world, as too for the hapū of Airini Donnelly. Airini did, and still does, have her detractors amongst her own iwi. The study of past events has left many with mixed feelings of Arini’s behaviour towards them due to her contentious land dealings. This kākahu reflects a time of Māori grappling with the onset of colonisation. The Taonga Māori in MTG collections, numbering in excess of 6000, reference this volatile period in our history. The McLean and Ebbett Collections held by MTG were mostly gathered during the land grab wars, and the Black Collection was gathered much later into MTG after these taonga were taken from burial caves on the East Coast. To know this kākahu of Airini Donnelly’s is to know the history of our country, Nova Zeelandia, subsequently anglicised to ‘New Zealand’ by James Cook. Māori adapted our art form of weaving to suit the colder climate of Aotearoa out of the necessity for warmer garments to survive. Out in the Pacific triangle the aute bark (paper mulberry) was used to make cloth, but our climate makes it difficult for this plant to grow here. The discovery of harakeke (NZ flax) was vital for Māori: we learnt how to extract the muka (inner fibre) from the leaves to twine it together, giving the foundation for kākahu. We also discovered other plants to use, along with animal skins and feathers. With the influx of Pākehā, Māori were mostly wearing European clothing by the end of the 1800s, and with this, the practice of raranga (weaving) was in decline. However in recent years the revival of this age-old art has seen contemporary weavers making full use of customary and contemporary materials with woven kākahu continuing to be highly valued. Airini Donnelly cloak gifted to MTG being welcomed into the building. Yesterday was International Women’s Day and the theme for this year is #BalanceforBetter. The cry for better balance and representation can be argued across many fronts – race, religion, gender and so on but for today I am focused on women. The story is good in the state sector, with women holding 45.7% of board and committee roles, and Chief Executive roles in the public service are 50% female. However, we are a long way off target across the country. As at June 2018 the New Zealand Stock Exchange listed the percentage of women directors on listed company boards at 22%. A 2017 Auckland University of Technology report found that with current progress it will take until 2030 “to close the gender gap in governance of the top 100 companies”. For a country that was the first to give women the vote, and currently has a female Prime Minister as well as Governor-General, shouldn’t we be doing better? When I take a look at my own sector things at the very top aren’t that great either. For ten years of my time at Auckland Museum there were no females in the senior management team. With the appointment of the first ever female Director in Auckland Museum’s history in 2007, a shift in the makeup of the senior managers also occurred. And today Auckland Museum has, to the best of my knowledge, its first ever female Board Chair as well as having an equal spread of male and female board members. 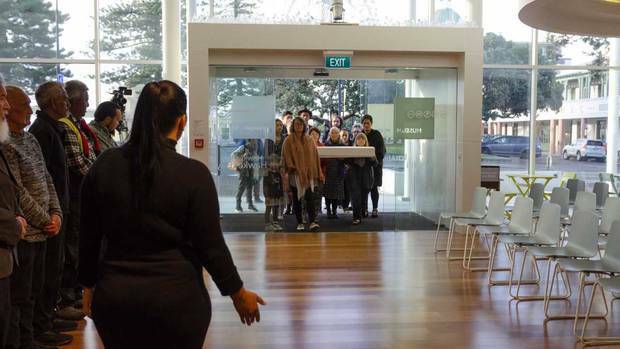 The major metropolitan museums and galleries around the country all currently have male Directors – although Auckland Art Gallery and Christchurch Art Gallery are replacing recent female Directors. We also have a poor track record when it comes to appointing New Zealanders to run our most important cultural institutions. At MTG Hawke’s Bay things are tracking reasonably well. Although I am only the second female Director in the institution’s history, four out of five managers are female and two out of five Trust Board members are female. But for an industry that’s had diversity and inclusion as major themes for over a decade, how is it not better reflected in the management of our industry leaders? A Grant Thornton research report released last year states that New Zealand ranks 33 out of 35 countries in relation to women in senior management roles – not great for a country that likes to ‘punch above its weight’ and be seen as a leader on the world stage. One thing that’s well known is, if people can’t see themselves (gender, ethnicity, etc) reflected in certain positions or roles it discourages them from even trying. If you only ever see men at the top table then how can women imagine themselves there? I have no issue with men being board members and running businesses or institutions, just imagine how much more vibrant and relevant the situation would be with people at the head table who reflect the character and makeup of our country. In the year ahead, let’s think about ways we can all get the balance better.